Mr. Warner worked very closely with the staff at the Department of Community and Cultural Affairs over many years as a tradition-bearer and Gombey historian, and was well known for his contribution to the Gombey tradition. 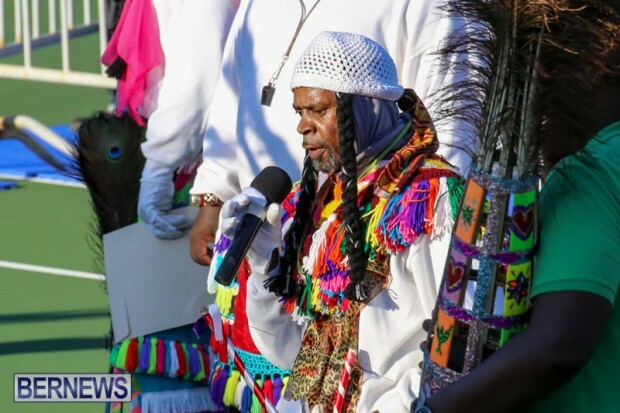 Minister Richards said, “I have known Allan for many years, as he and I once worked together at a local exempt company and also because I am an avid fan and follower of Gombey culture here in Bermuda. “Allan knew how much I loved the Gombeys and when we saw each other at work, he would occasionally ask with a smile on his face, ‘when was I going to join Warner Gombey Troop?’, because he had a costume ready for me, and we both would laugh. Allan was a standard bearer of preserving traditional Gombey Culture and his contribution to ‘The Gombeys’ over many years has been well documented. Mr Warner had a long history with the Gombeys, and his official biography said, “Allan Warner began Gombey dancing in 1959 at the age of three; having been introduced to this folk art form by his uncle Llewellyn ‘Termite’ Warner. Allan quickly became a talented dancer and began exploring the other elements associated with Gombey culture. “At age 9, Allan crafted his first Gombey costume; proud to have completed everything but the mask and pants, which he learned later. Allan began fluently drumming for Warner Gombeys at age 16, always concerned that the traditional rhythms that he beat out coincided with the various dances. “Allan was influenced by many drummers, including: Shorty Maynard, Henry ‘Gropher’ Wilson, Reginald ‘Way Way’ Wainwright, Eugene ‘Pond Dog’ Parsons, John ‘Pickles’ Spence, Roy ‘Rocky’ Hassell, Gerald ‘Beesie’ Greene, and Roy Young. Allan’s passion for drumming has also inspired and influenced other drummers, including: David ‘Tootsie’ Darrell, Gary ‘Sully’ Wellman, Jimmy ‘Furb’ Furbert, Ken ‘Ting’ Douglas, Ricky ‘Rick’ Smith, and Granville ‘Sticks’ Hughes. Allan’s passion for Gombey culture led to him becoming Captain of Warner’s Gombeys. Under his leadership, they travelled extensively representing Bermuda, including trips to: St. Kitts, Bahamas, Germany, Switzerland, New York, Philadelphia, North Carolina, Tennessee, and Washington D. C. They also performed locally in neighbourhoods, businesses, and hotels across the island. As Captain, Allan insisted that the Warner Gombeys perform at least three to five charity events each year, dazzling crowds at various seniors’ homes and Government School fairs. Allan was steadfast in his devotion to preserving Bermuda Gombey culture and history, apparent in an interview for the Smithsonian Folklife Festival; during which he discussed the spirit of the Gombeys: “I feel that the spirit is what is most important – more important than the headdress, more important than the costume, more important than the drummers. The spirit of the Gombey … is the core of one’s soul. Acknowledging that claim is the pride that you achieve, working towards elevating that.